Reader Frank is ecstatic to be living in his mostly original 1955 ranch home. It has been only a few short months since he moved in, but already Frank has been hard at work, decking out the home in his own retro, rustic, bohemian style. 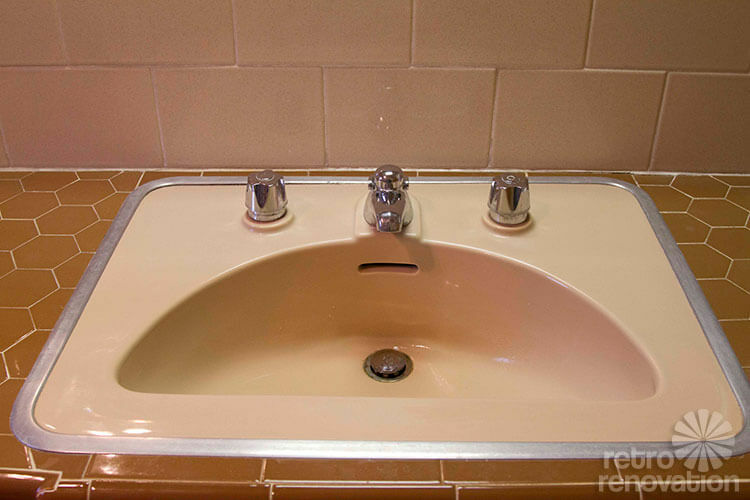 All of the rooms in the house are coming together quite nicely except for one — the beige and brown main bathroom, which has Frank stumped. 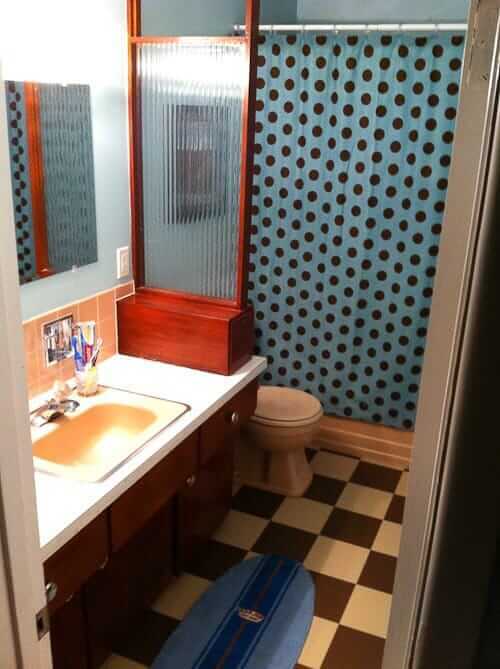 He loves that the original tile, vanity and other features are intact, but has wants our help with how to treat the walls and decorate this wonderful original space. Think we can give him a few ideas? I’ve been in my mid-century modern home … for about a month and a half now. The house was built in 1955. It is in mint condition and still contains almost all of its original features (whether they need(ed) a good scrubbing or not!). 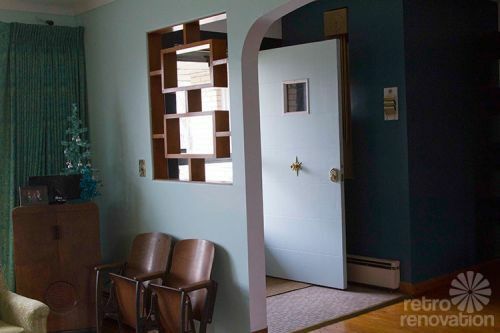 Included in this email are some shots of the foyer and sunken living room to get an idea of my style. 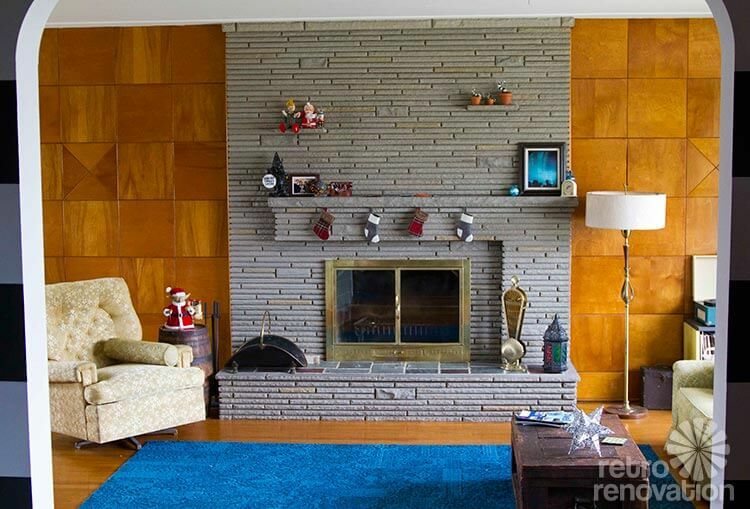 I’d say it’s retro, with a rustic, eclectic, bohemian flair. The one room I haven’t done anything with yet, nor do I know what to do, is the main bathroom. It still has all of the original tile, and I’m not sure what I can do to the walls or place on the counter to complement it. There are areas of wall space that need somethingggg. It could be some sort of shelves, accent wall, wallpaper, art — I’m just generally lost. Above the toilet and then next to the door if you’re walking out often cry out to me. Also, next to the mirror is a really tall indent. I was wondering if anyone knew what this would have been used for? I’m thinking there may have been shelves at one point. It’s odd that it goes to the ceiling. I really like the shower curtain I have, but it’s been through a lot. I was surprised that it fit so well considering it’s what I used in my apartment a few years ago! Well, I hope you can help out! I don’t have any inspiration at this point. I just want to make sure that whatever I do preserves the integrity of what’s there! 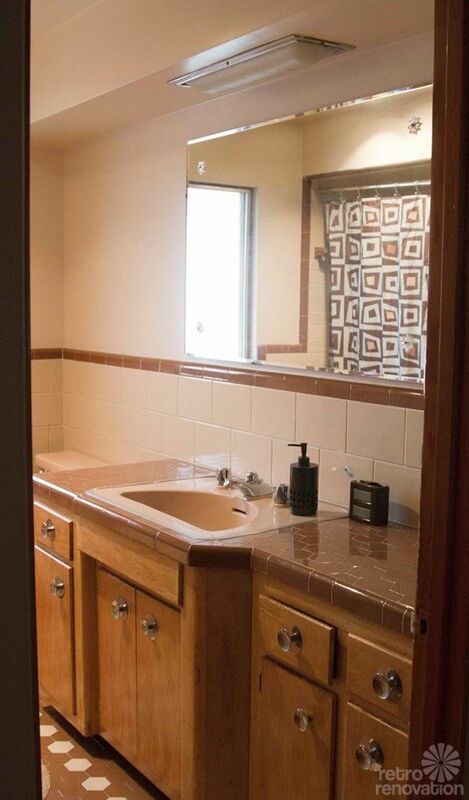 I included a few extra shots of the sink and tile. Btw, I forgot to say how much I love your blog. The curated ebay lists have helped me with a few things for my home! 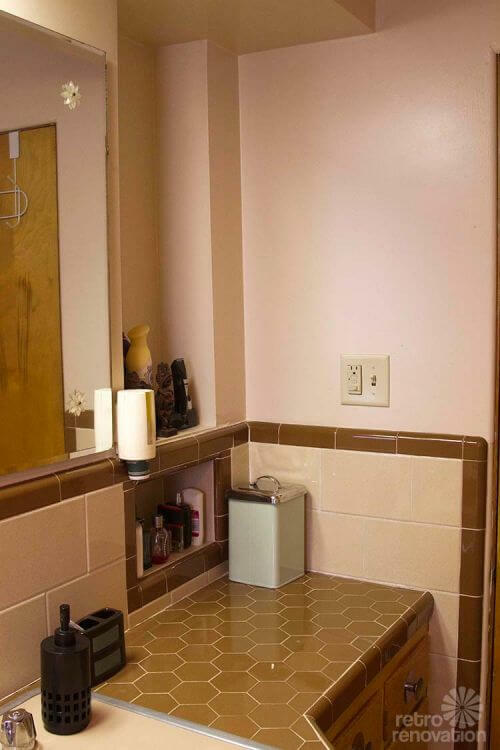 Wow, Frank, your bathroom — along with the rest of your house — is fantastic. We love the ‘parquet’ on the wall in the living room… the fireplace!… the wood floors… that peek-a-boo ‘window’ separating the foyer from the living room… all the bathroom tile… and especially, those large scale beige wall tiles in the bathroom — we’ve never seen any quite like that before — what a treasure! 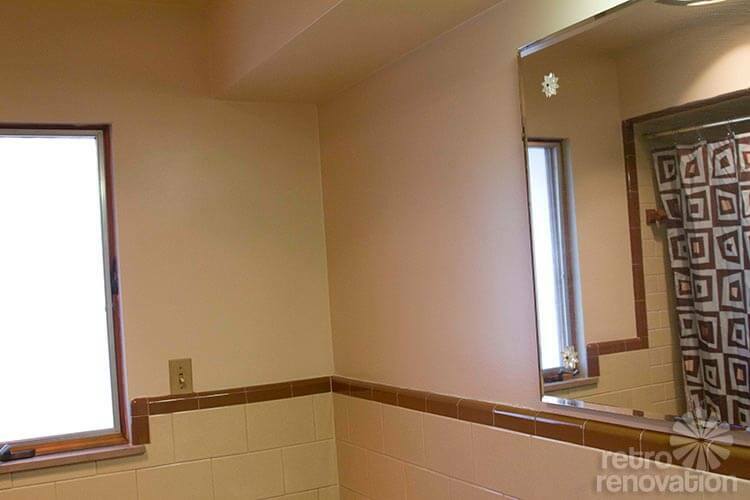 Readers — can we give Frank some ideas for how to decorate his brown and beige tile bathroom? Home made terrycloth towel cafe curtains with Classic Pom Pom Fringe, cocoa — Warehouse Fabrics, Inc.
Inspiration for my groovy feathered friends bathroom mood board came from a few key places — the photo of Frank’s living room, with its warm, golden wood wall and bright blue 70s style chenille FLOR carpet tiles and some of the elements already found in his bathroom, such as the golden yellow towels and owl bath mat. Keeping these design choices in mind, the first order of business was finding a shower curtain. While there is a lot of beige on the market today, the particular shade of dark brown in Frank’s bathroom is a little harder to come by — unless you look for vintage. 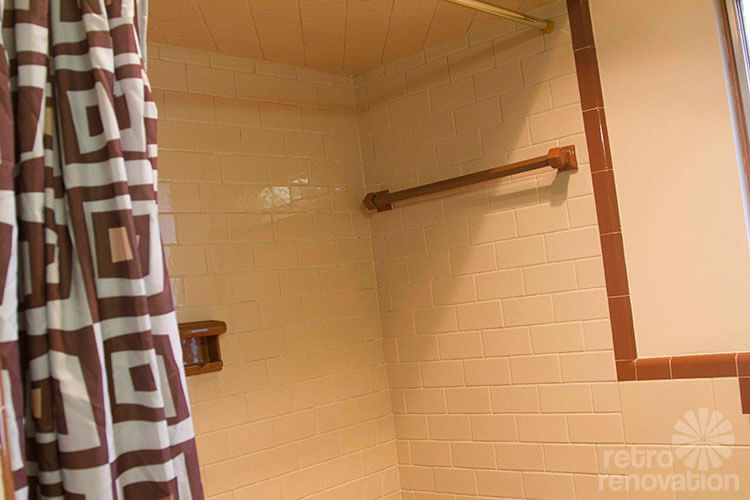 The 1970s tulips shower curtain helped set the color palette for the room. Not only does it have a range of browns and beiges in it, but it also has some blue and gold tones, which will help to liven up the space. 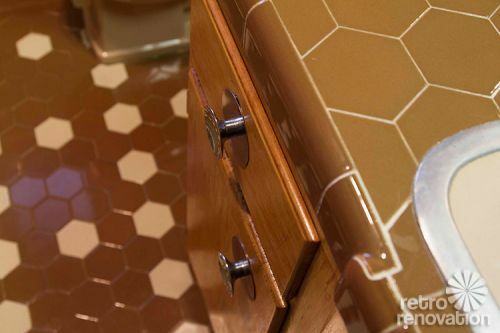 For the walls, Retro Renovation’s 2014 color of the year, harvest gold helps make the bathroom feel warm and sunny. 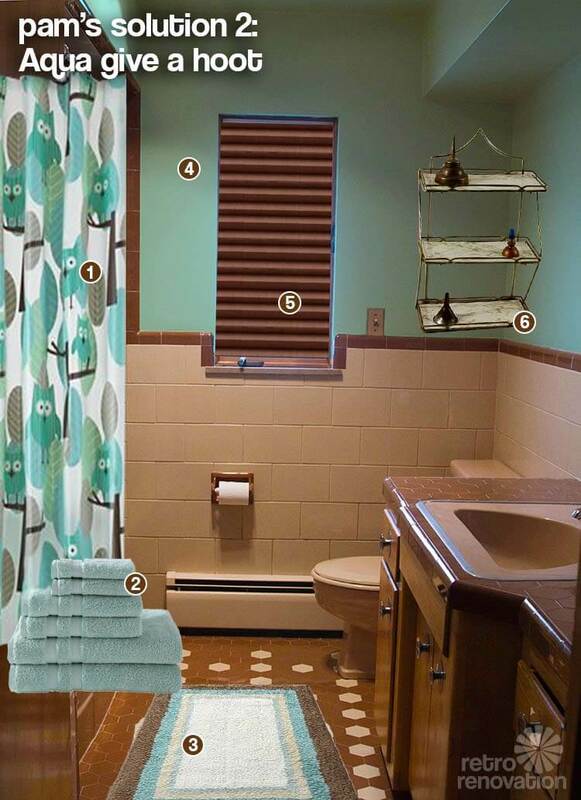 Frank already has some gold towels in the space and the addition of the deep aqua blue towels helps pick up the blues found in the shower curtain, plus it adds an interesting color contrast to the room’s otherwise warm hues. Frank’s whimsical owl bath mat sent me in the direction of an “owl theme” for the space. A variety of 60s and 70s owl wall hangings would easily add character to the empty wall space. If Frank isn’t that into owls, or wants to mix it up a bit, there are plenty of other options for retro wall decor — like the two vintage diamond shaped Syroco plant plaques — that would work in the space. In the recessed niche, a few small shelves could easily be added to house frequently used toiletries, and a budding collection of small owl or woodland creature vintage ceramic animals. 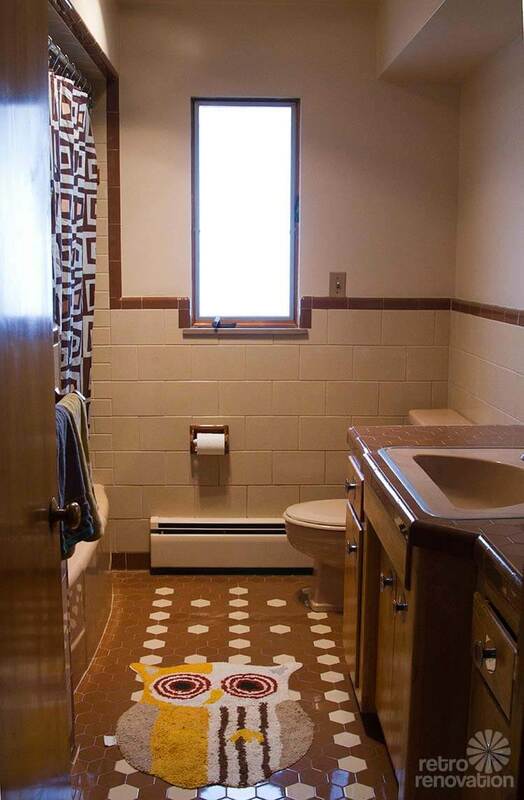 With all the color and pizazz going on in the upper part of the bathroom, a simple beige bath mat is both functional and helps break up the darker brown floor tiles. 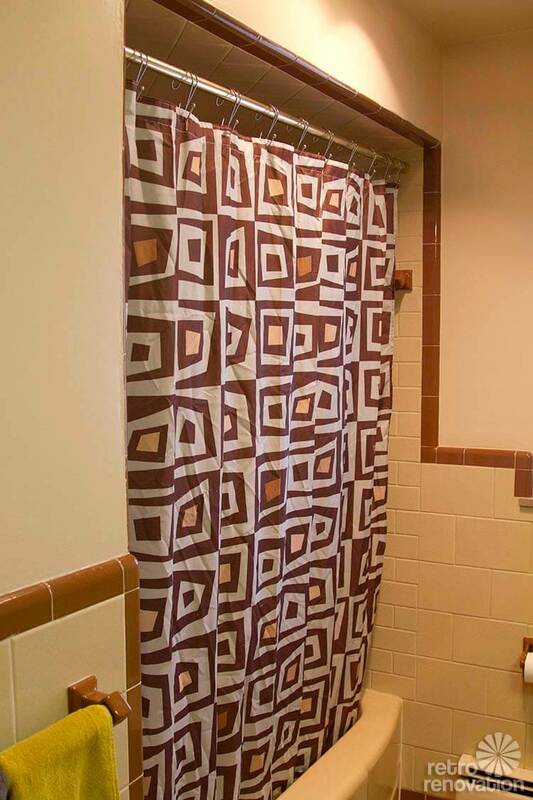 For the window treatment — if a curtain is needed — one or two of the gold towels could easily be fashioned into a cafe curtain and made a tad more 70s kitsch with the addition of a contrasting brown pom pom trim — just like my grandma used in her yellow bathroom. For Faux Bois & Fishies, I started by seeing if I could find a wallpaper to start with. And sure enough, I quickly found a vintage wallpaper from Hannah’s Treasures that helps pull the brown and beige together with a third color — aqua. Looks like there’s even a bit of pink in the wallpaper, and you know we like that! The scale of Hannah’s fishies paper seems like it would work with your tile, as well. After I found the wallpaper, the next challenge was the shower curtain. I like my shower curtains — even when they are “solid” colored — to have some pattern in the weave, so I was super psyched to find an aqua shower curtain with a diamond jacquard that sort of picked up on the little aqua squares in the wallpaper. Kate found the rug — awesome match! For towels, you really could use all the colors shown in the rug. 2″ aluminum blinds are SO authentic — although you will want to consider whether these, which will need to be wall-mounted on your casement window, will intrude into your space too much; if so, I like simple pleated shades, inset mounted, in a bathroom for privacy and light control. Finally, I found two Turner prints that would look good with this color scheme — they would go side-by-side abouve the toilet; the key in that space is scale of your artwork and of course, design. I’d really have to measure everything out to ensure these would fit (they may be too small) but you get my drift. Not too dinky on a wide tall wall space like that. When I spotted these on etsy — seller CurlsAllAround, I wanted to build you an entire third mood board. They’d look fabulous above the toilet, I bet. Rock on, vintage, rock on. In Aqua Give A Hoot, I stuck with the brown-beige-aqua color combination and quickly found this owl shower curtain at JCP. Hey, Kate and I both noticed you seemed to like owls. For the window, I found what looks to be a faux bois-patterned brown pleated shade, which amused me to no end. (There is faux bois in mood board #1, too, can you spot it?) However, for a pleated shade in brown like this, You would want to match the tile color as close as possible — this would be more important than pattern per se. Finally, while I did not try to deck the room out with wall thingies like Kate did, I did find a vintage shelf on etsy for above the toilet. However, if you end up outfitting the niche to the right of the mirror with shelves (I’d recommend glass; take a look at very streamlined mounting hardware from a shower door company) and displaying tchotchkes there, I would recommend that, rather than more tchotchkes above the toilet, you go for a large piece of art instead. With tchotchkes, you want not too many, not too few, just right. Not to mention, more to dust. I think that you need some really interesting art in there, something that is clean and complements your fantastic tile. Some of the other mod boards are too busy, plus I don;t think they capture your style. 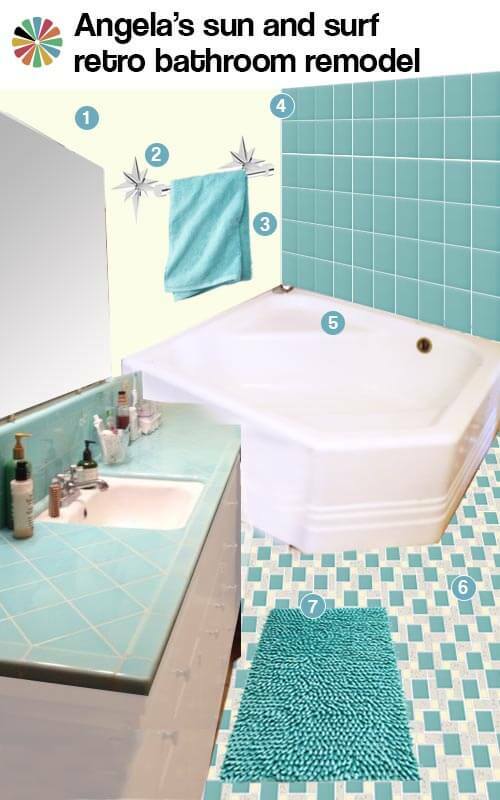 The third one is cleaner, but I am not crazy about the teal shade in your bathroom. 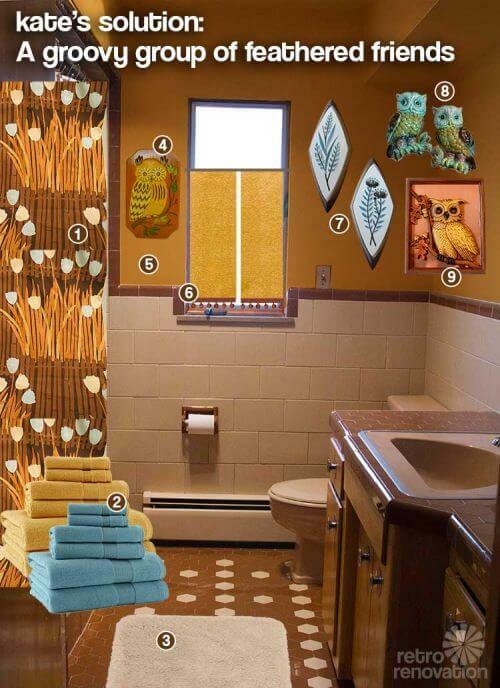 I suggest that you embrace the brown, by painting the walls brown. It creates a neutral space for any vintage art you find. I think that the orange red tones complement it well. I would paint the cabinets a soft white as they look a little shabby, Also paint the inside of the bathroom door and window trim. It will brighten things up. Definitely install shelves in that nook, and decorate with towels, vases, and glass jars for holding q tips and cotton balls. The shower curtain and bathroom rug are a blush color, the rug has a subtle stripe. Frank, why do you feel the need to do a single thing with this bathroom? It is just lovely as it is, the way it was originally designed and built! And this comes from someone who doesn’t really care for “brown on brown” decor! However, this room is beautiful, as is. I cannot believe you already had the shower curtain, which also fits in perfectly. Being a fan of aqua, if I had to choose one of the re-design ideas, I would go with the third. But really, I’d spend my decorating dollars on another room. Some simple wall decor is all you need here. I totally agree with you. The bathroom is wonderful on it’s own, it is too beautiful to add more than less. Let it speak for itself and keep things minimal. I would not paper, add a theme, etc….just paint. And I actually like the shower curtain, but those suggesting an aqua for towels is a plus and does bring a great color into the room. 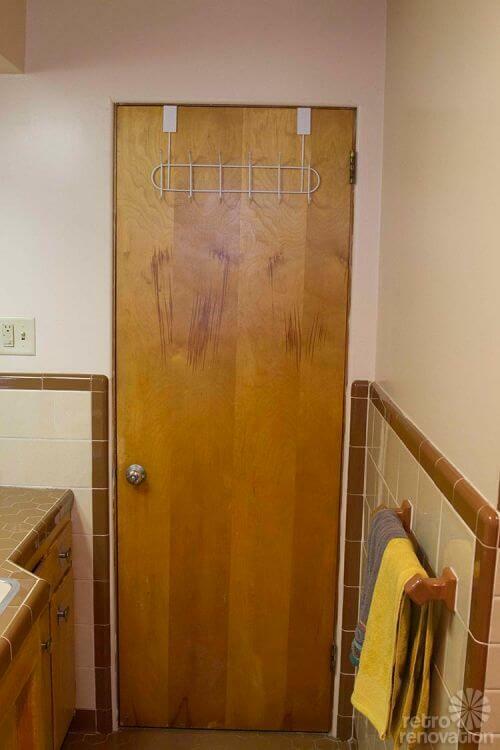 The towel bar over the toilet is high. 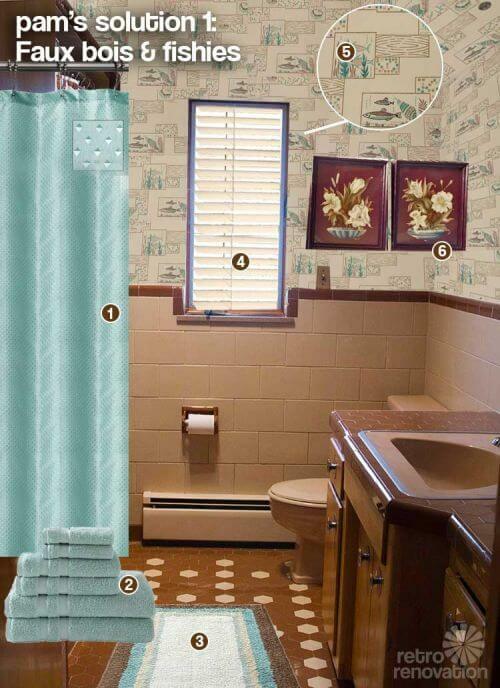 Add 3 or 4 large S hooks for hanging towels from them. Find a era specific theme pic for the wall on the left of it. Wouldn’t frame the mirror, it is original and needs nothing. A floor mat is up for grabs, you could just use one than can be folded over the tub when not in use. Obviously I’m minimal and strong on architectural details, which this bath has beautifully. Oh, I do like the idea of glass shelves in the niche with an era specific bath collection.